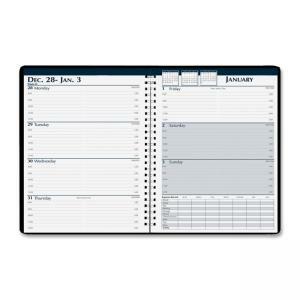 Expense Planner - Weekly - 7" x 10"
Weekly Expense Planner offers a way to maintain detailed expense records on a weekly basis while planning your daily schedule. Each two-page-per-week spread includes an Expense Record chart with preprinted prompts for each day of the week that include meals, hotel, tips, parking, postage, phone, entertainment, auto, gas, mileage and total. The weekly spreads also include ruled daily entries, half-hourly appointment times from 8 AM to 5 PM even on Saturday and Sunday, days remaining, days passed, Julian dates, and past, current and future months reference. Planning pages range 12 months from January to December and contain a high percentage of recycled material. Each week is numbered for easy tracking. Nonrefillable, wirebound planner also features a three-year reference calendar, travel hints, air mile information, area code listings, and toll-free numbers. The embossed cover is made of simulated leather for a professional appearance. Media Size: 7" x 10"